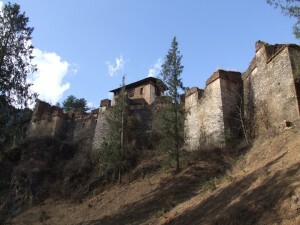 Eighteen kilometres from the town stands the burnt ruins of Drugyel Dzong. The dzong was built in 1649 by Zhabdrung Ngawang Namgyal to control the route to Tibet. It is said that the dzong had a false entrance which was deliberately designed to lure invaders into an enclosed courtyard. Drugyel dzong meaning ‘victorious fortress’ was named to commemorate Bhutan’s victory over Tibetan invaders in 1644. The dzong is today in ruins due to a fire which occurred in 1951.This is the place from where Bhutanese confronted and drove off several Tibetan armies during the 17th century. On a clear day Mount Jhomolhari can be seen from the dzong. For people interested in photography, Drugyel dzong will give them great opportunities to exercise their skills.